This Caterpillar is thought to feed on the foliage of various trees in the family MYRTACEAE, and to live singly in a shelter constructed by joining some leaves of the food plant with silk, retaining frass within the shelter. The caterpillar pupates within its webbed shelter. 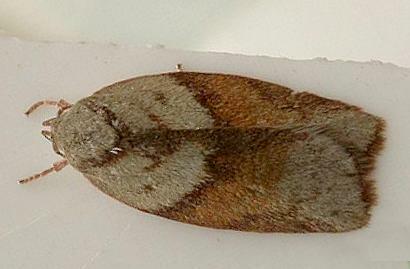 The adult moth of this species has pinkish-brown forewings each with grey areas at the base and margin. The thorax is also grey. The hindwings are off-white. The wingspan is about 2 cms. CSIRO Publishing, Melbourne 1994, p. 270. Volume 17, Number 1 (1893), p. 174.